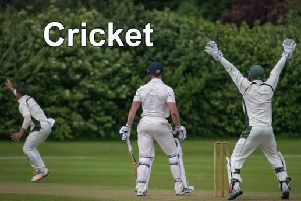 Boston CC Firsts claimed a 129-run success against basement boys Grimsby Town on Saturday. With the Mayflower men able to recall a few first team players, they looked much stronger on paper than they have in the previous few weeks. The coin came down in favour of captain Tom Baxter, and he opted to bat first on what looked a good pitch. The opening partnership of Ben Troops and Sam Holland built a steady base and an opening partnership of 129 set the platform for Boston to build on as Holland was stumped off the bowling of Alfie Warwick for 58. “They batted very well and set a great base for us to go on from,” Baxter said. Troops was run-out three runs short of 50 but Jonny Cheer and Ishan Jayaratne set about continuing to push Boston onto a large score. Cheer was dismissed by Tice and Mahir Yousuff fell to Warwick and Boston were 146-4. Tom Poole joined Jayaratne and they added 30 for the fifth wicket before Poole was dismissed by Warwick. A quickfire 20 from Michael Musson pushed Boston further along. Baxter was soon dismissed and it was left for Scott Elleray to partner Jayaratne to the end of the allotted overs as Boston posted 242-7. It was Jayaratne who added another valuable knock as he scored 68 not out from 45 balls. “Sam and Ben batted really well and set the platform but Ish’s innings was something else,” Baxter said. After the tea break, Jayaratne was the main man again. Two early wickets saw Tice and Warwick back in the pavilion as Grimsby were 3-2. A re-building partnership from Snell and Crossley gave Grimsby a glimmer of hope but Elleray dismissed Snell and then found the edge of Crossley’s bat to leave them 62-4. Paul Deans accounted for Warwick and Hallam before the re-introduction of Jayaratne picked up Aziz. Deans bowled Burgess before Jayaratne trapped Tice in front of his stumps. It was left to Deans to pick up the final wicket as he lured Maxwell down the track. Poole’s quick work saw him pick up his fourth wicket of the day. Boston’s 20 points pulled them up to fifth place but the league remains very tight.